A shoo-fly is being built on Sunset Boulevard in preparation for a bridge to be built to enable the 110 Freeway to connect with the Pasadena Freeway. 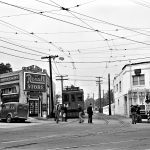 A Pacific Electric 100-Class car (most likely an Echo Park car) can been seen heading westbound on Sunset with a Hollywood car following a half-block behind. This is Sunset Blvd just north of downtown looking towards Union Station as can be referenced by the large natural gas storage tanks in the distance. The closest car here is a double-truck Birney probably on the Echo Park Line and a Hollywood car is seen in the distance. I believe that this location is where they are building the Pasadena Freeway just north of the 4-level interchange. The freeway will pass under Sunset so there is a wide detour for Sunset Blvd’s autos and the PE to allow for the construction of a bridge. 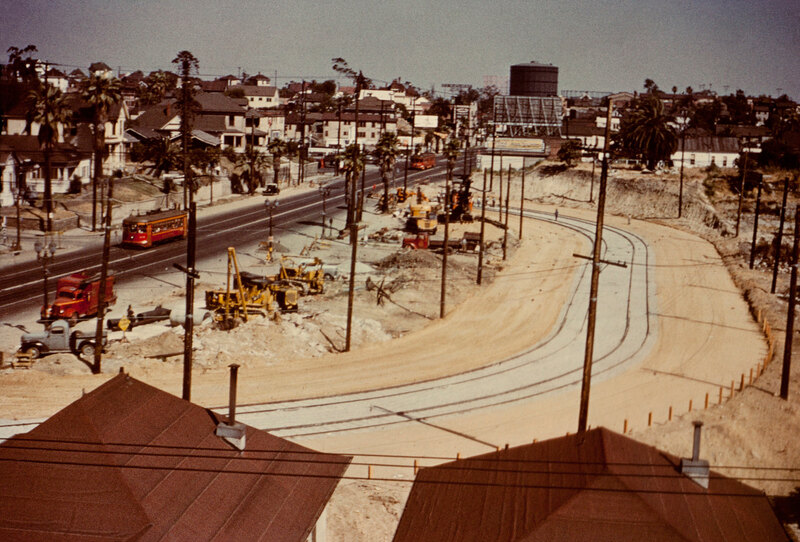 Once complete, the cars and PE will return to the original alignment of Sunset Blvd. A historical aerial photo of LA in 1948 shows this bridge completed but the freeway still under construction so I guess this photo was taken in 1947 or early ’48. Norm– PE’s 100 class cars were not Birneys! The 100’s were built by St Louis Car and were heavier and better built than Birney cars. Ira Swett, always said that the PE 100’s were “several cuts above” a Birney..a much better car on all counts.. The caption has a typo. It’s for the Hollywood Freeway, US 101, not 110. Swett always referred to this class as “New 100’s” to prevent confusion with earlier era cars.